On February 23, 1963, the Beatles were in the English midlands town of Mansfield, cowering in their dressing room while the Granada Theatre fell under a state of siege. There were girls screaming everywhere and, glancing around at one local musician, sat backstage with the bands having made his own way in over the roof behind the chip shop(! ), Paul McCartney happened to mention they were starving. They certainly were. Indeed, a full decade later, Paul McCartney would still remember the struggling young singer and his impromptu act of famine-relief; he remembered this good Samaritan’s name; and he might even have remembered his story. Because it really wasn’t the sort of tale which one forgot in a hurry. 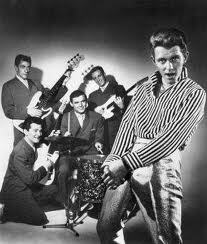 Johnny Theakstone was the forgotten man of early British rock’n’roll. Many others vie for the title, but none of them even come close. Dead before his 17th birthday; unknown and therefore, publicly unmourned; Theakstone nevertheless would live on when his group, Shane Fenton and the Fentones, persuaded roadie Bernard Jewry to slip into the title role to help them through a crisis… and then he died again, when Fenton’s own star slipped into obscurity, and the singer reinvented himself as glam rocker Alvin Stardust. Lining up as Theakstone (vocals), Gerry Wilcox (guitar), Mick Hay (rhythm guitar), future Hollies drummer Bobby Elliott and a bassist remembered only as Bonny, it was late in 1960 when Johnny Theakstone and the Tremoloes recorded an audition tape for the BBC late in 1960. The Corporation was constantly on the look-out for new acts to guest on the weekly Saturday Club show and, though the chances of being accepted were staggeringly slight, Theakstone was convinced his Tremoloes were equipped with virtually everything it took to succeed – except for a name. The first sign that anything was wrong came when Jewry dropped by Theakstone’s house one evening, to pick him up for a show. “I found him sitting on the settee in the lounge, with blankets wrapped all around him, very ill and too weak to stand.” Jewry stood in for him on stage that evening and, when Theakstone was admitted to hospital, he continued to deputize. The effect on the group was shattering. “We thought the best thing to do would be to fold it up out of respect for Johnny’s mum. And then… about a month after Johnny’s death… a letter arrived from the BBC saying they liked the tape we sent them, and were now offering us a studio test. Jewry said he wouldn’t. He became Shane Fenton that same afternoon. The newly reconstituted Shane Fenton and the Fentones sailed through the audition, early in 1961, and duly appeared on Saturday Club. Before the end of the day, the show’s M.D., Tommy Sanderson, had become the Fentones’ manager; by the end of the week, he had landed them a deal with EMI. September, 1961, saw Shane Fenton and the Fentones release their debut single, the stirring “I’m A Moody Guy,” backed by the old music hall favorite “Five Foot Two, Eyes Of Blue.” Days later, on October 3, the band received its media launch, at the Center of Sound in central London. They made their television debut on Thank Your Lucky Stars, and the record, as Jewry put it later, “…was away.” It eventually peaked at #19 on the British chart, and nobody doubted that a new star had been born – nobody, that is, apart from the record buying public. They were never convinced by this latest beat sensation, and the more they saw of them, it seemed, the less certain they were. That fact was brought home to them when the Beatles played Mansfield, and Jewry rushed home to get them some food. That night, he experienced what it was like to be at the top of the game. The following month, however, Shane and his Fentones were reminded of what it was like at the bottom, when they set off on another Parnes package, way down the bill behind Joe Meek’s Tornadoes, Rolf Harris and Joe Brown. It was the last thing they would ever do. In April, 1963, Shane Fenton and the Fentones broke up, and Jewry headed off to a solo career which was no more rewarding than his band act. “A Fool’s Paradise,” a wryly ironic title for a man who still dreamed of stardom, flopped that same month; “Don’t Do That” went belly-up in July. The only bright spot on the horizon was when he met Iris Caldwell, the Liverpudlian ballet dancer who would become his wife, and who had her own tale of Merseybeat-derived woe to tell – her brother was Rory Storm, the man who could, and maybe should, have beaten the Beatles to the top. For a time, Jewry moved into management, linking with Tommy Sanderson to oversee Bobby Elliott’s new band, the Hollies. But the following year he was performing again, as the husband and wife duo “Shane Fenton and Iris” took their song-and-dance routine through the cabaret clubs of northern England. And when 1972 brought Jewry a brand new record deal, he’d been Shane Fenton for so many years he didn’t even dream of finding another name to play with. His manager, Hal Carter, however, did, and a year or so later, as the singer’s new single, “My Coo Ca Choo,” awaited its release, he unveiled the new alias. Shane Fenton, Carter argued, was yesterday’s papers and, as the newly christened Alvin Stardust took his first steps back on stage, Jewry literally reveled in the mysterious new identity he and Carter had created. A star with no past, a man with no reputation, a leather clad, black gloved demon who stalked British pop television and refused to smile or even answer questions. It was true, Stardust chuckled, as he prepared for another sinisterly appareled television performance, the BBC’s immortal Top Of The Pops, nobody had an inkling who he was – or ever had been. And then another of the show’s guests walked by. Former Beatle Paul McCartney glanced over at Alvin, then paused for a moment, knowing he’d seen that face somewhere, but not quite able to pinpoint where. I reckon you have missed a bit off Mick Hay’s name it was Mick something but I can’t remember it. I remember Johnny Theakstone and his sister Maureen at the Palais in Mansfield. Years later I had cause to call Mansfield Police station and the duty officer who answered the phone was a Theakstone. 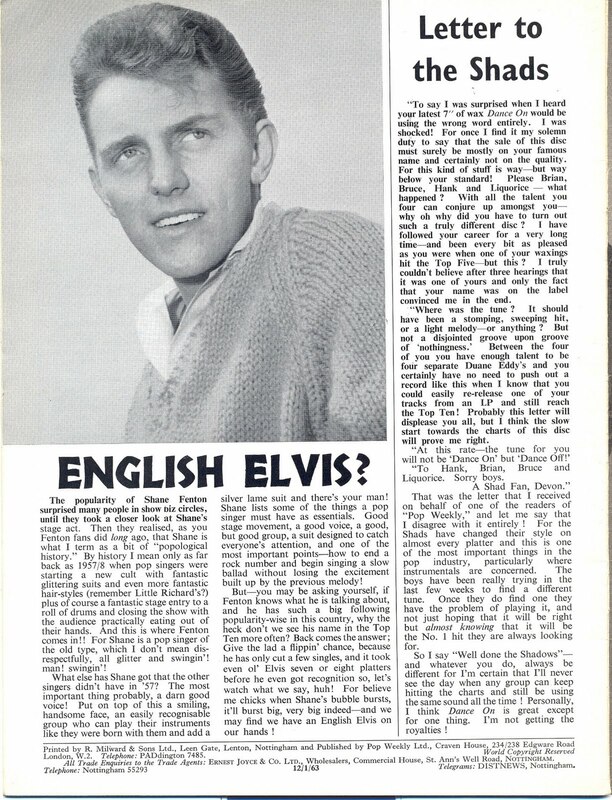 Shocked by the name which stirred up Palais memories he let me ramble on about this fantastic singer called Johnny T then proceeded to tell me he was his brother – born after Johnny had died’ I told him to tell his Mum Johnny was still remembered. This has also made me think of another young man dead at 17 yrs who also went to the Palais at that time soaking up the music.. Roger Upton he lived near the water tower up Berry Hill. Still remember you boys and I am in my 70’s now. Thank you for that – especially now, as we mourn Bernard/Shane/Alvin as well. And if you should remember the rest of Mick Hay’s name, please let me know! I have just found this ‘site’ I had not realised that there was so much information about my ‘Family’ and in particular my brother John. He had a terrific voice and would have undoubtedly gone on to bigger things. He brought lots of happiness when appearing at Mansfield Palis De Dance, Freddie Fitzgerald thought the world of him and encouraged him greatly. Such wonderful memories of happy teenage years for me albeit tinged with great sadness due to John’s early death. Maureen – thanks so much for getting in touch. Great to hear from you! It was Mick Eyre. Does anyone know what happened to him after they broke up ? Also the rest of the Fentones. Mick Eyre still lives in Mansfield however, he sadly suffers with mental illness and rarely goes out . ‘Bonney’ who you may remember was one of the guitarist,, he lives in Canada with his wife and family but returns to visit his family yearly on his last visit he met with Mick and did take him out for a while. I am not aware of the whereabouts of Tony the drummer or Jack the other guitarist. I last saw Bonney at Christmas he always visited with my parents but sadly My father dies last November. Hope this helps a little. Jack the guitarist used to live on Stanley Road in Mansfield in1970’s. They were my neighbours and I seem to remember that they moved to Newark. I once saw Mick in Boots the Chemists in the shopping centre, in Mansfield he looked dreadful. Shuffling around in a pair of Wellington Boots and an old Donkey Jacket. A Tattoo on his forehead, every one moving out of his way. It was so sad, he was so good looking .Many ,many years ago ..